Popular culture is riddled with different imagery of the modern scientist – Doc Brown and his flux capacitor; Tony Stark and his talking house and flying suit; Dr. Frankenstein and his monster. However, all of these examples and countless others skip over the process at the heart of scientific discovery and development. The laborious, painstaking and iterative process of the scientific method. Edison’s exact words are debated, but the clear and concise insight the Edison anecdote gives us into the scientific method is clear. All the glory, praise and attention in science is given to the one moment when a new theory is proven, a new discovery is made, or a new product is developed, but the thousands and thousands of ideas, experiments, and observations that brought us to that ‘a-ha’ moment are too often glossed over and forgotten. However, without this context, scientific discovery can at times seem daunting or even frightening. Further, without an understanding of how the discovery was made, the public may often distrust the new theory or technology. Without an understanding of the rigor, the debate, the failures, the successes, and all the steps along the way to ensure sound science, the public may simply see a new discovery as too strange or even too innovative to make sense or feel safe. This is true of developments in medicine and technology, and it is certainly true of Genetically Modified Organisms (GMOs). This is where the scientific method comes in. By following the scientific method, the “how” is answered. The unknown can become known, and new discoveries and processes can be replicated, reviewed, and regulated by other scientists and overseeing bodies. Test hypothesis with an experiment. Analyze the data gathered in the experiment. If the hypothesis is confirmed, then put together a report and communicate the results to their peers. If the hypothesis is not confirmed, go back, construct a new hypothesis, and repeat the process until the answer to the question is found. Seems simple enough, but you may be wondering how does this process actually work in the real world and how can the same process work for my 5th grade science project and for the development of complex discoveries like GMO crops? Let’s take a close look at the steps of the scientific method with a special eye toward the development of a GMO, a scientific and regulatory process that costs an estimated average of $136 million and takes roughly 13 years to complete. Note: The scientific method takes us through the discovery or research and development stage of creating a new GMO. 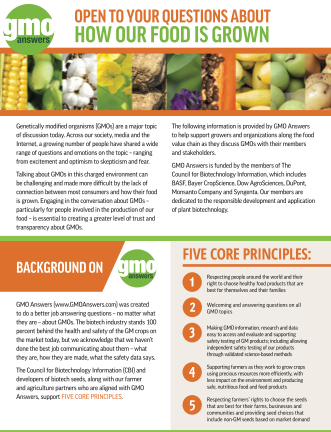 After the scientific method is implemented in the R&D phase, a new GMO must undergo years of field tests, regulatory compliance checks, and safety tests before reaching the market. The first step in the scientific method starts with asking a question about an observation: How, What, When, Who, Which, Why, or Where? For GMOs the question is often about the trait scientists are looking to develop. For example, what is the gene that makes certain crops more resistance to drought than others? Or, how can we create a papaya that is resistant to ringspot virus? In order to craft a testable hypothesis it is critical to do some background research into the question. Rather than starting from scratch, a thorough literature review can ensure you build on the work of other scientists, streamline your own testing procedures and avoid mistakes made by others. A hypothesis is essentially an educated guess at the answer to your initial question – If I do BLANK, then BLANK will happen. This hypothesis will create the backbone of the experiment phase, so it is critical that your hypothesis is simple, easily measurable, and can be tested. Once a team of scientists developing a GMO has identified a gene or series of genes that control the desired trait, a new potential GMO crop enters what is called Phase 1: Proof of Concept. At the beginning of proof of concept the scientists develop a series of hypotheses to test. They look for the best method and place to insert the genes into the target plant DNA to create the optimal result, a plant whose only change is the new desired trait and is virtually the exact same in every other regard. Once you have a strong hypothesis it is now time to test the prediction with an experiment. The goal of an experiment is to determine if the hypothesis is supported or not. These experiments are set up so the only changing factor is the specific variable you are testing for according to your hypothesis. The test must be fair and easily replicated. 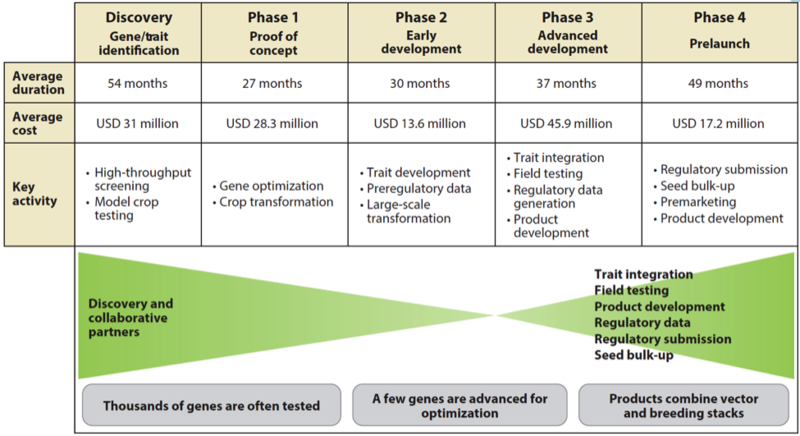 “During phase 1, genes that were identified during the gene discovery process are transformed into the target crop. This phase also marks the beginning of a thorough safety assessment of GE crops, which begins early and spans the entire product development process. In simpler terms, during phase 1 the scientists insert new genes into different parts of the target plant’s genetic code. They create thousands of different lines of new genetically modified plants, each variation testing a different hypothesis. The scientists are looking for the one perfect ‘event’ or gene insertion method and location in the original genetic code that creates the desired effect without making any other changes to the plant. All of this phase 1 testing is done in a lab, green house or grow house, so the only variable is the new gene. 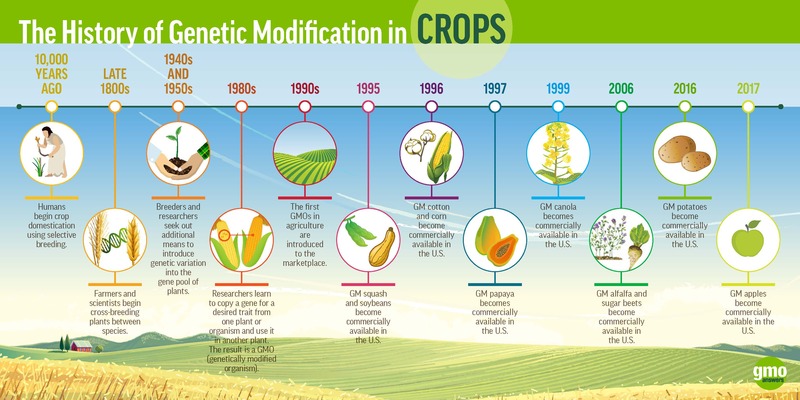 Another interesting thing to note on GMO development is that during this time the scientists are also already beginning the safety assessments of the new plants. By knowing the new protein made by the GMO, they look for similarities to any known allergens. This process continues through each stage of development. 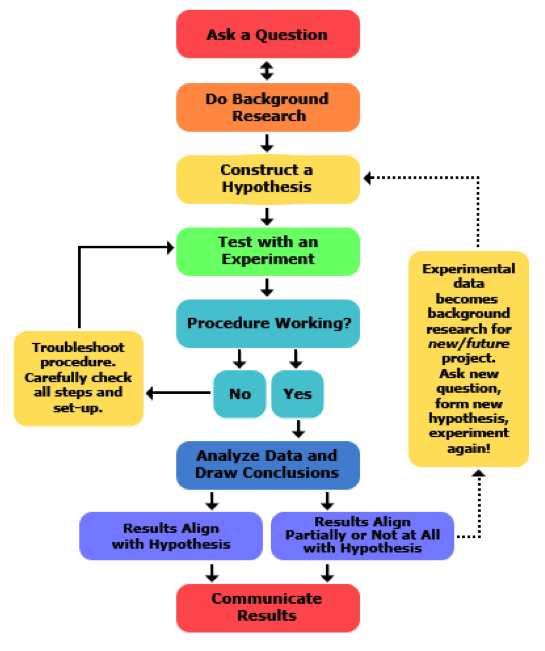 Once your experiment is complete, it’s time to analyze the results against your hypothesis. Based on your results, was your hypothesis a true statement or a false statement? Often times the answer will be false – remember Edison and his 10,000 ways that don’t make a lightbulb? If that is the case, it’s back to Step 3 and a new hypothesis with the knowledge gained from your experiment. Then the scientific method process continues until they land on the solution to the question. Remember those thousands upon thousands of different strains of plants created in Phase 1 of GMO development? Of those tens of thousands of GMOs the vast majority of them will not perfectly meet the all of the traits the team of scientists are searching for and will be discarded. The scientists are looking for that one plant, whose only distinguishable difference is the trait they are looking to change. For some scientific endeavors, success is a successful hypothesis. At which point a team writes up their report, including research, methodology and results and presents their findings to their peers who can then study and replicate their results to see if they stand up to scrutiny. Negative results are also reported, so other scientists can learn from the unsuccessful hypothesis. 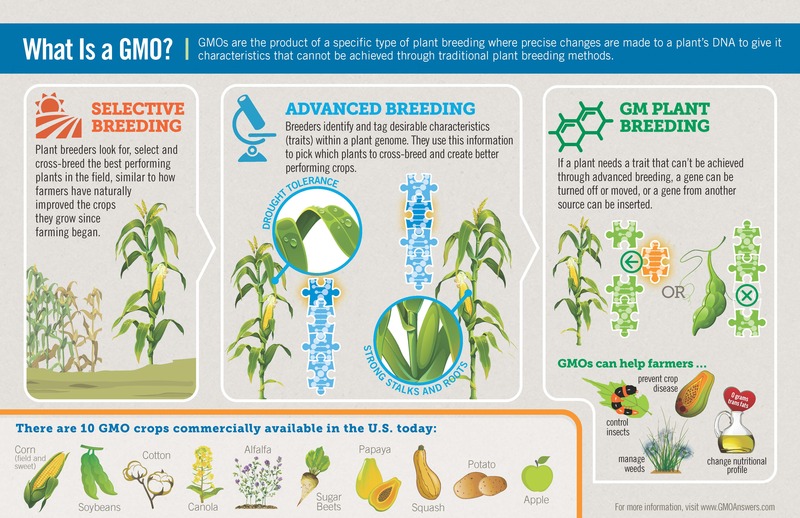 For GMOs, however, it is not that simple. Proof of concept, achieved in Phase 1 is just the beginning. There are years of safety testing, field trials, and regulatory hurdles ahead. The scientists need to ensure the plan they created in a greenhouse or lab can thrive in normal growing conditions. They need to test how extreme weather impacts the plants. 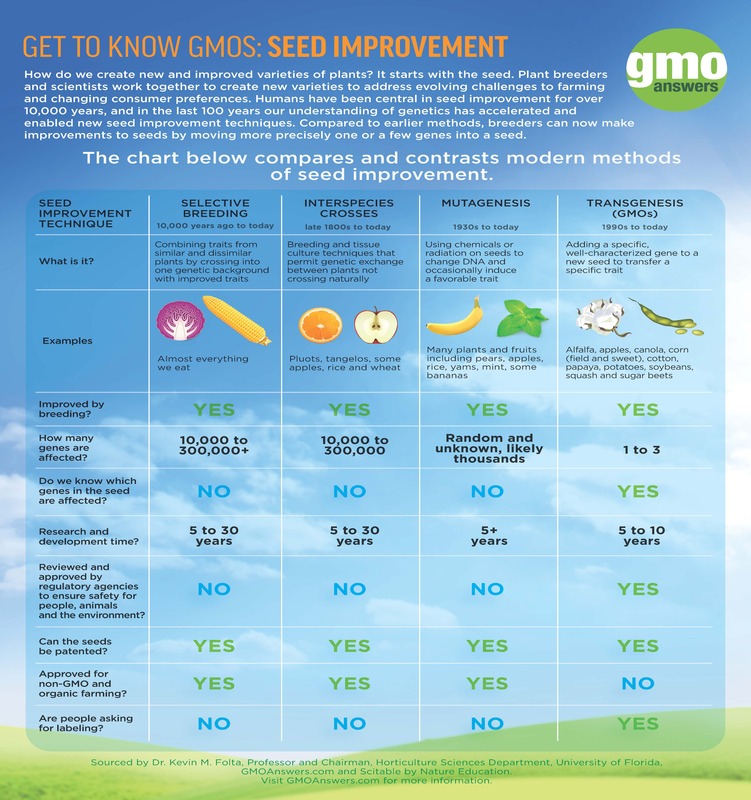 They continue the ongoing safety tests, and each country around the world has its own unique regulatory requirements and approval processes before a new GMO can be brought to market. The scientific method is at the heart of all of these tests and procedures. The scientific method is a painstaking process. It takes time, patience and hard work, and unlike the movies there is no montage to speed through it. Teams of scientists dedicate their lives to this process in hopes of making the few discoveries that finally make it to the public. However, when they do they can change the world. Thomas Edison found the one way to make a light bulb. Teams of scientists have found ways to save papayas from disease, pack nutrients into rice to enrich the diets of the malnourished, and make crops resistant to pests. All by doing the work and following the scientific method.